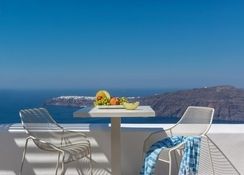 The White Santorini Suites & Spa is an exclusive luxury, adult-only, upscale hotel located in the Village of Imerovigli, Santorini Island in Greece. The hotel houses multiple pools and is set against pristine blue waters of the caldera and the Aegean Sea. The famous Santorini's volcano and hot springs are about 2km away from the property. The luxury hotel is known for its traditional Greek style of architecture which is designed with prominent shades of white and blue. The hotel has 10 guestrooms on its premises and The luxury resort hotel has facilities for breakfast, lunch, dinner and snacks of a wide variety of international and local Greek cuisines along with alcoholic and non-alcoholic beverages. The hotel also houses a luxury, up-market spa on its premises that offer numerous massage therapies. Proximity to the village of Imerovigli, the hotel presents its guests with a unique opportunity to experience the heritage, culture and the modern-day country life in Greece intimately. The White Santorini Suites & Spa is located in the village of Imerovigli and is located 1km away from the Main Square. The closest airport, Santorini Airport, is just 8.2km from the hotel. The Paros National Airport is 153km away from the hotel. The popular Red Beach is 15.8km away from the property. The Monolothis Beach is also located 5km away from the property. Local tourist attractions like Art Space Santorini, Archaeological Site of Akrotiri, Ancient Thera, Red Beach, White Beach, Santorini Water Park, Port of Koufonissia, Skaros, Megaro Gyzi, Archaeological Museum of Thera, Museum of Prehistoric Thera, Central Bus Station, Volcano, Cape Columbo Beach, Naval Museum of Oia, Santorini Port and Monolithos Beach are located within a distance range of 15km away from the hotel. 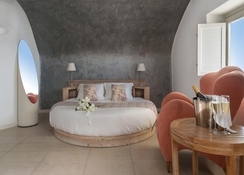 The White Santorini Suites & Spa has 10 tastefully decorated rooms with architectural elements of Greek style featuring the shades of white and blue. The rooms are categorised into 6 types based on amenities, space and number of occupants. Junior Suites, Superior Suites, Deluxe Suites, Cream Suite, Pearl Honeymoon Suite and White Suite are the type of guestrooms available at the hotel. The rooms are equipped with amenities like air-conditioning, heating, mini bar, satellite TV, direct dial phone, safety deposit box, etc. The bathrooms are equipped with amenities like hairdryer, bathtub, shower, exclusive luxury toiletries and personal care items, and bath linens. Almost all the rooms have a private terrace with a swimming pool and hot tub overlooking the pristine blue sea. The White Santorini Suites & Spa houses has an in-house chef and the team that cater to the gastronomical demands of guests. The guests can enjoy their breakfast, lunch, dinner and snacks in privacy of their suites. The in-house bar also serves exclusive wines, beer, cocktails and other alcoholic and non-alcoholic beverages. The proximity of the hotel to the Village of Imerovigli offers the guests an opportunity to visit the local eateries and bars that serves international as well as local Greek cuisines. The White Santorini Suites & Spa houses multiple swimming pools where the guests can enjoy refreshing swim, relax and unwind. The hotel also houses an upmarket spa and wellness centre, The White Cave Spa, where the guests can pamper themselves and enjoy massages and wellness treatments. The guests can hire a car and visit local tourist attractions like Art Space Santorini, Archaeological Site of Akrotiri, Ancient Thera, Red Beach, White Beach, Santorini Water Park, Port of Koufonissia, Skaros, Megaro Gyzi, Archaeological Museum of Thera, Museum of Prehistoric Thera, Central Bus Station, Volcano, Cape Columbo Beach, Naval Museum of Oia, Santorini Port and Monolithos Beach. The guests can also visit the famous Santorini's volcano and the nearby hot springs, which is close to the hotel.